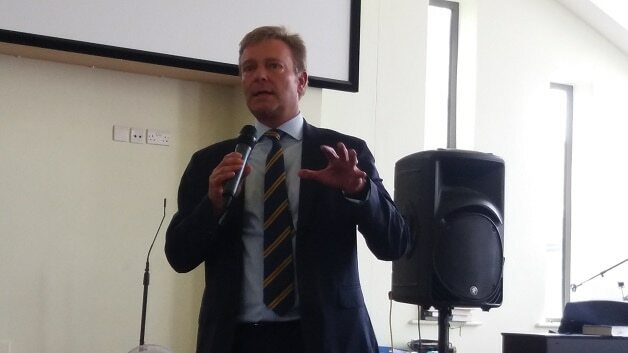 Somebody always wants your opinion in Thanet – do we abolish our stroke services? Do we really need an A&E bit to our hospital? How do we make “savings” of £400,000 from our bus services? Shall we elect some real people as county councillors or just suits who don’t take buses – ever? And perhaps don’t listen to the people who pay their allowances….. I went along to a huge meeting in Broadstairs in the Baptist church – where speakers sit under a massive cross – which should concentrate the brain on moral integrity or something. It was about our bus services and Councillor Mike Whiting, Kent County Council cabinet member for Transport, was there to listen to people’s worries. 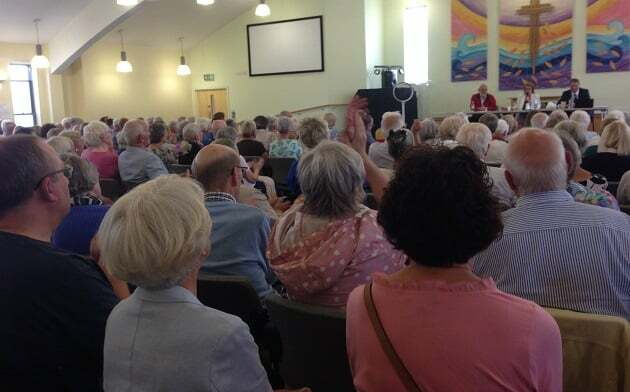 KCC have apparently been consulting people about this for a while – they called it the Big Conversation – but almost none of the 400 odd people at this meeting had ever been invited. I never was and I like a nice conversation, especially about buses as I don’t drive, can’t walk far, and have lots of opinions. But this wasn’t part of that official consultation so Mike said it wasn’t being minuted. Rumbles went around the room as we realised whatever we said wasn’t going to be taken seriously. At 2.30pm when most people of working age were at work, we were all elderly and many were stick users or decrepit in some way. KCC spends £68 million on bus passes so between us we represented a huge expenditure on poor Mike’s part. All paid to boost the profits of private companies as KCC doesn’t run any bus services itself. Not that Mike does any of that. One of the first questions was : “When did you last take a bus yourself?” “Well, between six and eight (Hours, days? NO) WEEKS ago”. That did not go down well. After a few incredulous guffaws, the audience got quite stroppy, especially the ones that live on threatened routes. We don’t get that many chances to have a bit of a shout at our politicians and the good pensioners of Thanet certainly took it! There have been rumours of axing bus services, especially the number 56 which serves bits of Thanet that the Loop doesn’t reach. According to Mike it’s safe for the time being and they will consult properly before doing anything about it. Well I don’t know how many people have to say “please keep it”, but most people there will be furious if it goes. Pity it wasn’t an “official” consultation. Mike’s preference seems to be to hold those nowhere near where people live and not on a bus route – like the last one which was at Margate football ground in the evening, and attracted only forty people. Mike spoke a little wistfully of how Transport for London, under Labour mayor Sadiq Khan, was able to make decisions about bus routes and timetables. I asked him if he wished we could have Transport for Kent, and would he lobby his transport minister to let him have his own transport network? You know – one run for the benefit of the residents and not the profits of the likes of Stagecoach, who have a monopoly round here. Well guess who was there lurking at the back? 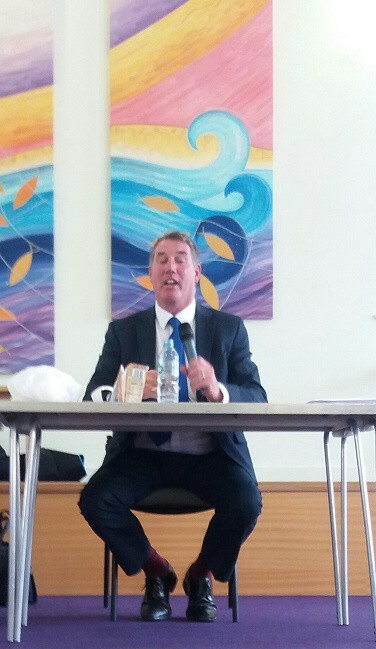 Someone spotted that our MP was actually in the room! So Craig Mackinlay was reluctantly dragged to the front, and we all hoped he’d be like the good fairy in Sleeping Beauty who might reverse the evil fairy’s spell. But no! Not his job, he said. “I’m just here to listen. You need to lobby KCC.” So the buck was passed and it’s now down to us to find the good fairy…. or lobby the bad one. As we came out there was a rush for the last 56 bus which leaves Broadstairs for North Foreland just after four. After that you’re on your feet. Or stuck at home. Mike had to rush off too because his parking ticket ran out at 4.15. But as he gets a travel allowance and has his own car it may be longer than six weeks before he needs to take another bus. 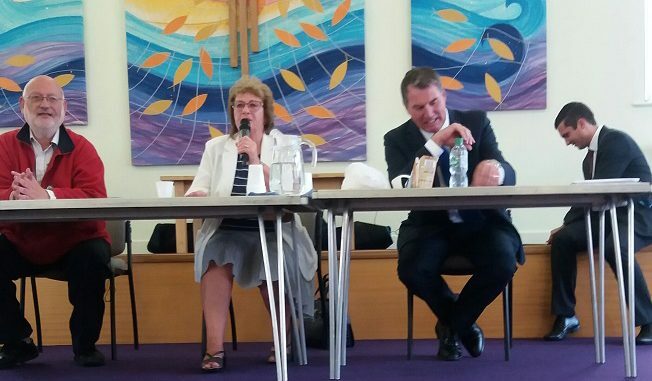 *Cllr Whiting said: “I was delighted to have been invited to the meeting in Broadstairs and to explain the position. Clearly there has been a lot of misinformation about what is happening which has caused distress for many in the area. “There are currently no proposals to cut any KCC subsidised bus services. “If any such proposals were to come forward, they would be subject to specific and detailed consultation. “At present we are in discussions with operators to see how we might take routes in Thanet and in Sevenoaks out of subsidy by amending the commercial bus network in a way that replaces the key elements of the subsidised routes. Cut cut cut that’s all we hear, are any of us any better off from all the money that is being saved? No of course not. The only increase in spending we hear of is that given to outher countries OUR money just given away. Like Anne Long, all I ever hear about is cuts, cuts , cuts and no benefit coming to me. Though I notice that the government has been quick to reduce taxation on the very rich. So none of that will be coming to me , either. As for more money going to other countries, this idea gets trotted out from time to time to divert our attention away from the wealthy individuals and Corporations who get away with paying almost no tax at all because of various , permitted tax dodges. But they get away with it because their newspapers tell us to complain about money apparently going to other countries! A lot of our “generous” foreign aid only goes to pay for construction in other nations where the companies involved are British businesses getting the work. So a lot of foreign aid just comes straight back to the UK in the pockets of the owners of big engineering companies. A lot more foreign aid is spent on military ventures in Iraq and Afghanistan, use to build schools and clinics to try to win over the long-suffering locals.The hiring of mercenaries to guard various UK facilities also gets included as “aid”. It should really be included in the military budget but it’s more “convenient” to call it “aid”. The UN has suggested that developed countries pay just .7 of 1% of GDP (ie less than one penny in every pound) in genuine foreign aid. Britain only manages to achieve this by , as I say, counting military spending , or subsidies to UK construction companies, as “Foreign aid”. I don’t begrudge help going to tackle poverty and disease in other countries . The amount is paltry compared to the wealth this country possesses. The only problem is that wealth is so unfairly distributed, here AND abroad. May we see the minutes? Well done, Christine. You are well known for telling it how it is – not how people want us to hear it. The announcement this week that Crossrail will now not open for another year will be a major blow for Sadiq Khan. His policy has been to freeze Transport For London (TFL) prices on trains, tubes, buses and trams in the capital. However, 150 year old infrastructure needs considerable investment and, with ridership on TFL decreasing, the additional income from fares that Crossrail would bring is much needed. Home working and UBER culture are a couple of factors responsible for the reduction in fare revenue. These are lifestyle changes that planners need to accept so funding for upgrades to public transport will have to be rethought. Crossrail, who for years have trotted out their “on time and on budget” mantra, are now neither. Their announcement, slipped out while Parliament takes a holiday and only 4 months before the first trains were due to run, is far from welcome and will hit many, including Kent commuters. In Kent, we have our own public transport issues. Funding threats to rural bus services, overcrowding on trains and plans such as Thanet Parkway station that make sense to very few. None can be dealt with in isolation. If transport planning is done properly it is about integration and lifestyle. Take Parkway, a station in a field outside Cliffsend. It would once have been a short bus ride from the terminal at Manston Airport. It will supposedly alleviate the parking problem in Ramsgate. It will attract business to an already full Sandwich Discovery Park. A stop at Parkway station will add 2 minutes to a journey to Canterbury or Ashford, a stretch of track that already suffers from 40mph speed restrictions in part. Who will use it? If not Manston passengers, what about Stone Hill Park residents and businesses? Ah yes, our Local Plan doesn’t go for that. Joined up thinking? Integration requires big picture strategy and will not work if political or siloed mentalities are allowed to dominate. Too often we hear of this problem here or that scheme there but rarely about the overarching strategy. What is the big picture for Thanet and how does it integrate with the rest of Kent and beyond? How do we manage our infrastructure so that it works for those who live and work here. How do we ensure what we plan today is fit for the lifestyles and businesses of tomorrow? In a line, can we continue to trust the current decision makers at Thanet District Council and Kent County Council? I have questioned many policies in the council chambers, including the £millions spending planned to give a 1 minute improvement in rail journey times from Thanet to London and the new station in a field. I am challenging cuts to bus services. I have very publicly supported plans for a mixed use development on the former Manston Airport site bringing much needed homes and jobs to the isle. I admit that even these campaigns fail on the integration stakes but it doesn’t mean the passion and strategy for bigger thinking isn’t there. Liked the bit at the meeting when we were asked who had heard of The Big Conversation and only a handful of the 400 attendees put their hands up ! Either the ones running these ‘conversations’ keep it so secret so that no one turns up so nothing needs to be done or they are totally useless at communicating with any the electorate.